As children are intrinsically more sensitive to the effects of X-rays than adults, there is an urgent need to optimize CT exposure protocols for pediatric patients. The objective of optimization in CT exposures is to obtain acceptable image quality with minimum dose to the patients; reduction of dose in itself is not the objective of medical exposures. From this point of view, in recent times, much work has been done on optimization of scanning parameters in routine clinical conditions.,,, The foundation of optimization is the establishment of diagnostic reference levels (DRLs), first proposed by the ICRP in 1996 and later introduced into European  and Irish legislation. ICRP defines DRLs as “a form of investigation level applied to an easily measured quantity, usually the absorbed dose in air or tissue-equivalent material at the surface of (or inside) a simple standard phantom or a representative patient.” This definition strongly emphasizes that DRLs are not the dose limits and do not help distinguish between good and poor medical practice. Although dose limits for occupational exposures must not be exceeded, patient DRLs may be exceeded if clinically necessary. DRLs also differ from dose limits for occupational exposure because they are not used to constrain individual patient exposures; this is because a dose higher than the standard dose may be required depending on the patient's body size and weight. DRLs are a tool for identifying facilities with unusually high doses and for promoting the optimization process. Separate DRLs have been established for each country and/or region because equipment and procedure protocols can vary between different facilities in countries or regions, mainly due to different patient sizes and their weights. It is usually defined for a large collection of data at the 75th percentile. It can be defined at local level for a minimum number of 10–20 patients and preferably for a much larger number. By averaging such data from a large number of hospitals, the national DRLs can be estimated., Hence, establishing national DRL would definitely ensure a safer pediatric CT diagnosis from patient's perspective. The purpose of DRLs is optimization of the imaging technique rather than radiation dose reduction to patients. If a justified examination does not provide the necessary clinical information because of too low dose resulting in an inadequate image quality, then the patient has been exposed needlessly to radiation. In clinical practice, it is assumed that the necessary dosage, within stipulated margins, will be used. In this line, it is essential to initially establish zonal DRL, namely, South, North, East, West and central and finally consolidate them to arrive at the pediatric DRL for the country. Thus, the objective of our study was to measure radiation dose for most commonly performed pediatric head, chest, and abdomen procedures in the radiology department in Tamil Nadu hospitals and suggest/derive pediatric DRLs, compare them with the internationally recommended DRLs and to suggest dose reduction methods without disturbing image quality. When attempting to establish regional CT DRLs which are applicable to all hospitals in Tamil Nadu, it is essential to sample as many hospitals as possible. The hospitals incorporated were equally spread over in the state of Tamil Nadu. This work was performed in thirty CT scanners which include both conventional and multidetector CT (MDCT) types installed at various major cities (Chennai, Coimbatore, Madurai, Salem, Erode, Tirupur, Namakkal, Trichy, Vellore, Dindigul, Dharmapuri, Hosur, Thiruvarur). The selection of the scanners was based on the number of pediatric patients investigated. The average number of pediatric patients scanned each day in the Tamil Nadu region was 3000: From this 1100 for head, 900 for chest and 1000 for abdomen CT procedures were performed. The total number of patients examined each day in the region was approximately 9000. 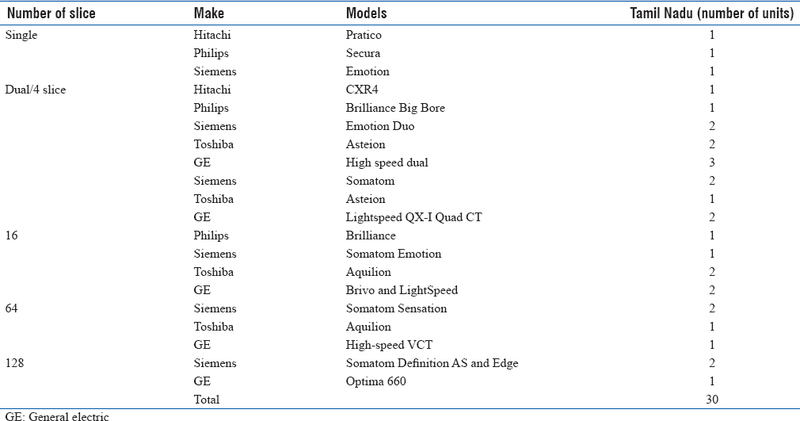 [Table 1] summarizes the make and model of the CT scanners involved in this study. Before collecting the patient dose data, CT dose index (CTDI) measurements were carried out on all CT scanners by using calibrated 100 mm pencil ionization chamber (DCT10 RS, S/N 1636) and solidose electrometer 400 (S/N 4253) of RTI Electronics, Sweden. For this purpose, polymethyl methacrylate head (10 cm diameter) and body (16 cm diameter) phantoms were used. The dosimetry methods recommended in the European guidelines  were followed. The individual approximate patient dose data were estimated from the phantom CTDIv and DLP measurements. It should be noted that phantom measurements are only a measure of the actual patient dose. Furthermore, it requires correction for different pediatric patient diameter. Before initiating measurements in hospitals, a questionnaire was prepared to collect data regarding the pediatric CT protocols and clinical practices adopted by the hospitals in Tamil Nadu. These data helped to record the pediatric CTDI values for different scanning protocols adopted by the various departments. Participants were asked to extract from the scanner library, data for twenty patients belonging to each examination type and each age group in thirty CT departments (a total of 120 [20 (patients) × 3 (sites) × 2 (age group)] × 30 = 3600 procedures). 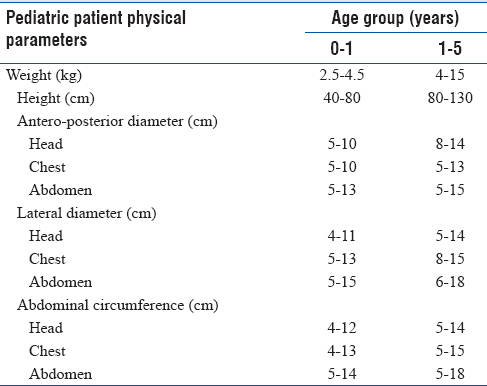 In each category of machine, the lowest, highest, and mean physical parameters and operating parameters of both age group of pediatric patients are presented in [Table 2] and [Table 3]. Each row in this table refers to the parameters of the scanners mentioned in [Table 1] in the same order. This data abstraction has been done as per “Nationwide Evaluation of X-ray Trends” protocol. The questionnaire contains a number of parameters including (i) make and model of the CT scanner, (ii) patient physical parameters such as height, weight, lateral diameter and anteroposterior diameter, (iii) indication, (iv) interested organ, (v) phase such as pre- and post-contrast, arterial phase, venous phase, full bladder, and delay phase, (vi) routine scan parameters such as tube potential, tube current, scan time, rotation time, slice thickness, slice beam collimation, pitch, total slices, field of view, start couch level and end couch level, (vii) dose-related data such as displayed volumetric CTDI and DLP. The majority of the hospitals have followed almost similar exposure parameters for chest and abdomen procedures. However, the newer scanner systems like 64 slice, 128 slice CT machines use AEC/care kV technique for pediatric patients. Some of the CT centers have used larger scan length for routine brain and abdomen procedures. Further, it was noted that individual CT radiographers selected different scan parameters for the same type of pediatric patients. CT dose experiments were carried out by placing the standard head and body phantom at the isocenter of the CT scanner and applying one axial slice of a clinical head protocol in sequential scan mode. The dose received by the phantom at the five positions for a set of scan parameters was measured by placing the ion chamber in one hole at a time while plugging the rest of holes with acrylic rods. Before carrying out the regional dose estimation, complete QA (electrical, mechanical, and radiation checks) was performed for all the machines involved in this work. One among these tests was the measurement of CTDIw for standard protocol involving tube potential of 80 kV, 100 kV, and 120 kV, tube current-time product of 100 mAs and 5 mm slice thickness. These values were compared with the CTDIw displayed on the console to ensure that the measured and displayed values agreed as per Atomic Energy Regulatory Board standards (maximum ± 18%). The CT dose indices were measured based on the five point method proposed by European guidelines using standard CTDI phantoms and suitable detector. The pediatric CTDI phantom was placed on the couch and aligning the central axis of the phantom with isocentre point of the gantry. As per FDA's recommendation the dose is measured at the four peripheral holes as well as the central hole. The measured CTDIv and DLP of pediatric head, chest and abdomen procedures for both age groups at different CT departments are presented in [Figure 1] and [Figure 2]. 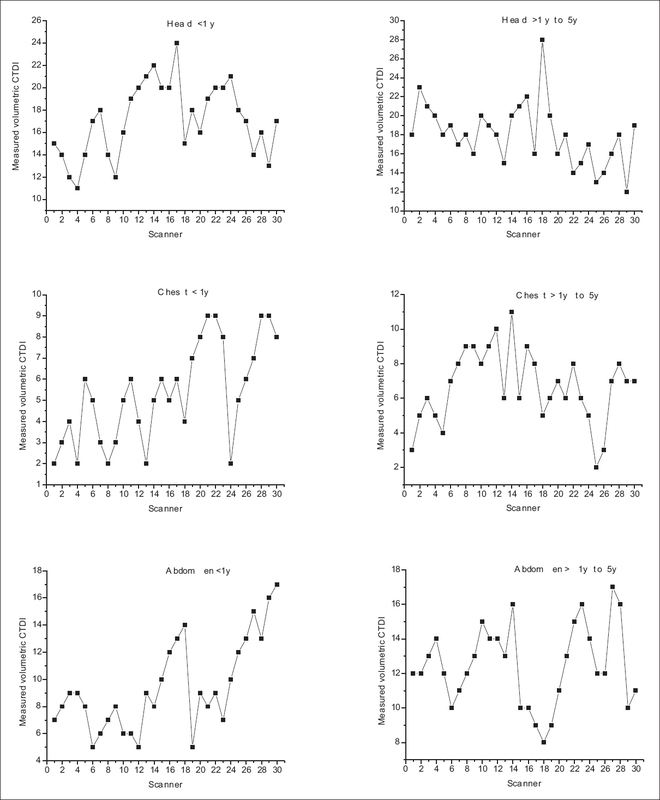 Figure 1: Calculated volumetric computed tomography dose index for <1 year and 1–5 years age group of pediatric patients for select procedures. 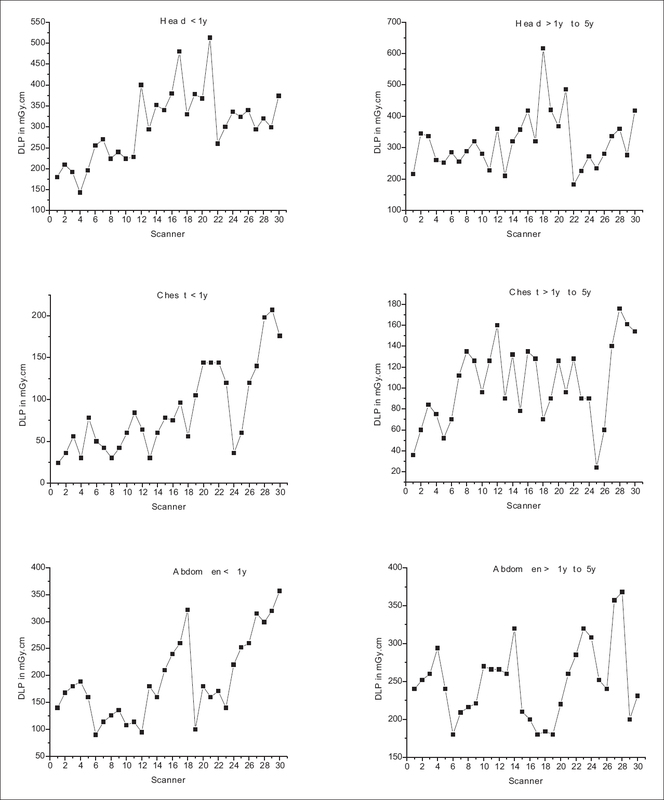 Figure 2: Calculated dose length product for <1 year and 1–5 years age group of pediatric patients for select procedures. [Figure 1] and [Figure 2] show that the large variations in CT radiation doses for pediatric head, chest, and abdomen procedures were noted for both age groups. This may be attributed to scans conducted without optimization of tube voltage and tube current-time product (mAs) with respect to the patient anatomy and organ of interest. Out of thirty CT departments, twenty CT departments have followed larger scan length for routine procedures; this will also give rise to an increase in the patient dose. Further, in this work, it was observed that based on the experience and knowledge of the radiographers, the selection of exposure parameters was altered from the default values. Those who have experience, have selected appropriate scan parameters when compared with newer radiographers; this also contributes to minimize radiation dose. Further, in this study, latest advancements and concepts in CT technology and selection of techniques such as detector arrangements, detector size, number of detectors, scan speed, tube rotation time, and type of detector (e.g., stellar detector in Siemens CT) available in recent MDCT scanners have been employed with reduction of radiation dose when compared with older CT scanners for pediatric patients. Further, using overall calculated CTDIv and DLP value for both age groups of pediatric patients, the 75th percentile of CTDIv and DLP for head, chest and abdomen procedures thus calculated was taken as their respective third quartile values for each group of pediatric patients. The pediatric CT DRL proposed for Tamil Nadu region in south India has been compared with DRL recently proposed by EC  in [Table 4] and [Table 5] [extracted from [Figure 1] and [Figure 2]. From [Table 4] and [Table 5], it was observed that the 75th percentile of CTDIv of pediatric head is lower than European DRL for both age groups. For chest and abdomen procedures, the 75th percentile of CTDIv is higher than European DRL for both age groups. This may be attributed to selection of greater exposure parameters for pediatric chest and abdomen procedures as compared to European practice. Following the European regulations, it becomes necessary to take into account the body size and habitus for selection of optimum machine parameters (e.g., tube voltage and mAs) for the required diagnostic information with minimum dose to the patient. In addition, it was observed that the 75th percentile of DLP of pediatric head for 0–1 year old patients is higher and for 1–5 years old patients is lower than European PiDRL, and for chest and abdomen procedures was higher than European pediatric DRL for both age groups. This is mainly because of choosing higher scan length for both procedures and both age groups. From this study, it is suggested that it is very important to justify CT examinations in advance and once the decision for CT scan is taken, it is mandatory to adopt the ALARA principle strictly. In this line, radiologists should play essential advisory role with referring clinicians. When equal or greater diagnostic yields are expected, CT should be replaced by alternative imaging modalities such as sonography, magnetic resonance imaging, or radionuclide voiding cystography. On the other hand, radiologists should make every effort to reduce the pediatric radiation dose of CT examinations while maintaining diagnostic quality when CT is indicated. Furthermore, minimizing the scan range of CT examinations as required is a straightforward way to achieve this goal. CT radiographer should follow the strategies for pediatric CT dose optimization methods, namely, body size adopted CT protocols, tube current modulation, optimal tube voltage, scan modes, appropriate pitch, appropriate scan length, and field of view to reduce the pediatric CT radiation dose for selected procedures. This study reports the regional pediatric CT DRLs for head, chest and abdomen procedures for the first time in Tamil Nadu region. More than 3600 individual patients' data were recorded and studied. The experimentally measured CTDIv and DLP values for all procedures were compared with displayed control console values (maximum ± 18%). Tamil Nadu pediatric CT DRL values have been proposed for CTDIv and DLP of head, chest, and abdomen procedures for <1 year and 1–5 years age group of patients. These proposed DRL values were compared with the pediatric European DRL values and strategies for pediatric CT dose reduction have been suggested. In this line, all clinicians who request pediatric CT should frequently assess its suitability on a case-by-case basis. When used carefully, CT is a valuable imaging modality for both age groups of children. Atomic Energy Regulatory Board, Mumbai and PSG College of Technology, Coimbatore, Tamil Nadu, India. Donnelly LF, Emery KH, Brody AS, Laor T, Gylys-Morin VM, Anton CG, et al. Minimizing radiation dose for pediatric body applications of single-detector helical CT: Strategies at a large Children's Hospital. AJR Am J Roentgenol 2001;176:303-6. Lam W, Wendy WM Lam. Pediatric CT radiation risks: What you should know. Med Bull 2006;11:5-7. Brenner David J. One size does not fit all: Reducing risks from pediatric CT. ACR Bull 2001;57:20-3. Frush DP, Donnelly LF, Rosen NS. Computed tomography and radiation risks: What pediatric health care providers should know. Pediatrics 2003;112:951-7. Wakeford R. The cancer epidemiology of radiation. Oncogene 2004;23:6404-28. UNSCEAR. Sources and Effects of Ionizing Radiation. New York: UNSCEAR; 2000. Pierce DA, Shimizu Y, Preston DL, Vaeth M, Mabuchi K. Studies of the mortality of atomic bomb survivors. Report 12, Part I. Cancer: 1950-1990. Radiat Res 1996;146:1-27. Preston DL, Ron E, Tokuoka S, Funamoto S, Nishi N, Soda M, et al. Solid cancer incidence in atomic bomb survivors: 1958-1998. Radiat Res 2007;168:1-64. Chodick G, Kim KP, Shwarz M, Horev G, Shalev V, Ron E. Radiation risks from pediatric computed tomography scanning. Pediatr Endocrinol Rev 2009;7:29-36. Bongartz G, Golding S, Jurik A, Leonardi M. European Commission. European Guidelines on Quality Criteria for Computed Tomography (Report EUR 16262). Luxemburg: European Commission; 1999. Feigal DW Jr. FDA public health notification: Reducing radiation risk from computed tomography for pediatric and small adult patients. Int J Trauma Nurs 2002;8:1-2. Brenner D, Elliston C, Hall E, Berdon W. Estimated risks of radiation-induced fatal cancer from pediatric CT. AJR Am J Roentgenol 2001;176:289-96. Sternberg S. CT Scans in Children Linked to Cancer Later. USA Today, 01 April, 2001. Hamberg LM, Rhea JT, Hunter GJ, Thrall JH. Multidetector row CT: Radiation dose characteristics. Radiology 2003;226:762-72. Jangland L, Sanner E, Persliden J. Dose reduction in computed tomography by individualized scan protocols. Acta Radiol 2004;45:301-7. Boone JM, Geraghty EM, Seibert JA, Wootton-Gorges SL. Dose reduction in pediatric CT: A rational approach. Radiology 2003;228:352-60. Radiological protection and safety in medicine. A report of the International Commission on Radiological Protection. Ann ICRP 1996;26:1-47. European Community. On health protection of individuals against the dangers of ionizing radiation in relation to medical exposure. Council directive 97/43 (Euratom). J Radiol Prot 1998;18:133-7. European Guidelines on Quality Criteria for Computed Tomography. Report EUR 16262. Brussels, Belgium: European Commission; 2000. Staniszewska MA. Evaluation of patient exposure in computerised tomogram in Poland. Radiat Prot Dosimetry 2002;98:437-40. McCollough CH, Rochester MN. Diagnostic Reference Levels, American College of Radiology; 2010. Available from: http://WWW.IMAGEWISELY.ORG. [Last accessed on 2016 Nov 10]. CT Dose Profiler, Probe for Evaluation of CT Systems Manual-Version 5.2A, RTI, Sweden. Available from: http://www.rti.se/. [Last accessed on 2013 May 20]. Saravanakumar A, Vaideki K, Govindarajan KN, Jayakumar S, Devanand B. Cost-effective pediatric head and body phantoms for computed tomography dosimetry and its evaluation using pencil ion chamber and CT dose profiler. J Med Phys 2015;40:170-5. Nationwide Evaluation of X-ray Trends (N.E.X.T). Tabulation and Graphical Summary of 2000 Survey of Computed Tomography; 2007. Available from: http://www.crcpd.org/PDF/NEXT2000CTProl.pdf. [Last accessed on 2016 Nov 14]. Saravanakumar A, Vaideki K, Govindarajan KN, Jayakumar S Establishment of diagnostic reference levels in computed tomography for select procedures in Pudhuchery, India. J Med Phys 2014;39:50-5. AERB/RSD/MDX-CT/QAR/2010, Acceptance/Performance Test for Computed Tomography (CT) Scanner; 2010. Available from: http://www.aerb.gov.in/cgi-bin/X-Ray/XRAYuserform.asp. [Last accessed on 2016 Nov 14]. European Guidelines on DRLs for Pediatric Imaging, Final Complete Draft for PiDRL Workshop; 30 September, 2015. p. 38. Available from: http://www.eurosafeimaging.org. [Last accessed on 2015 Nov 05].